It’s a party of four now that I have added these two spiffy stools. With them I can now kick back solo or gather more than two friends for evening cocktails. After long hours of trolling online for something other than the usual outdoor furniture choices, it was a happy moment when I found the Lebello website. The stools’ woven wicker appearance is the perfect compliment to my vintage metal rocking chairs. 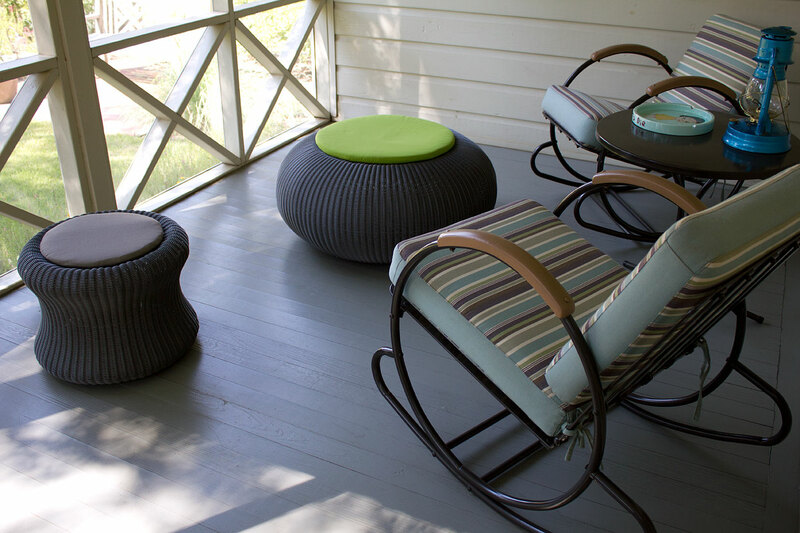 And because the wicker is made from HDPE (High Density Polyethylene synthetic fibers) the stools can withstand all the weather extremes that Texas can throw at the them. Which brings me back around to my original point… if they’re so easy to clean, let’s party and have a few accidents. The smaller one is called the Marshmellow, and since it was in stock, it shipped immediately. I had to wait two months for the delivery of the larger ottoman, Mega Spinball, since it was a custom order.